The trouble with cocktail tasting events is the journey home, which can be a little protracted, five martinis down. Not so at Portabello Road Gin’s new four-storey mecca on the corner of Portabello and Talbot Roads. The former pub has been done out as a space for lovers of the spirit to come to taste, buy, make and learn about their favourite tipple, and even sleep off their ruinous hangovers upstairs. 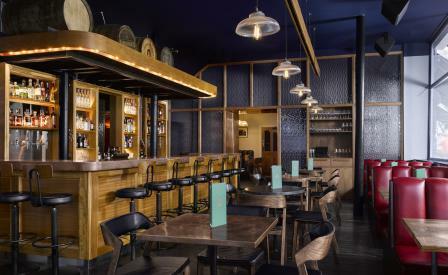 Complete with museum, shop, two bars, a private dining space, a gin making room with a 400-litre copper still and three guest rooms, the concept is an inspired idea by the four entrepreneurs behind the label, who have enjoyed a steady and successful climb up the ladder of London’s fickle spirits market. Plush grey and white linen, midcentury furniture, botanical artwork and bespoke record players kitted out with Rough Trade vinyl soundtracks make the rooms a fine place to retire after an afternoon creating your own bespoke gin flavours in the cosy belowground Ginstitute. If you’ve been fed one too many negronis by master distiller Jake Burger you can refuel on josper oven cooked steaks and modern British small plates at the art deco style Resting Room, or some Basque-inspired tapas from the deft hands of former Pintura Kitchen & Bar chef Greg Lewis at GinTonica on the first floor.